These instructions will help you prepare to setup your PlanPlus Mobile app on your iOS device. 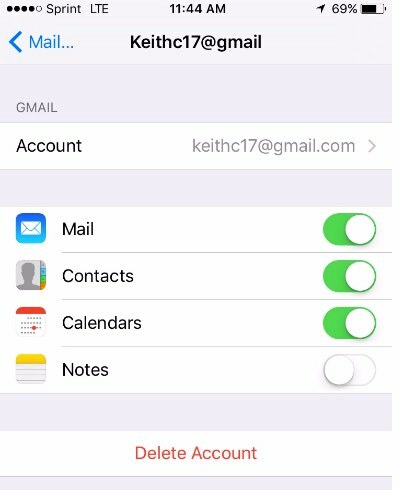 Verify the Accounts (Mail, Contacts, Calendar) on your device. Which of the Accounts that is setup on your phone do you want to sync to PlanPlusOnline? Note: PlanPlusOnline will not have its own “Account” in your list of accounts. 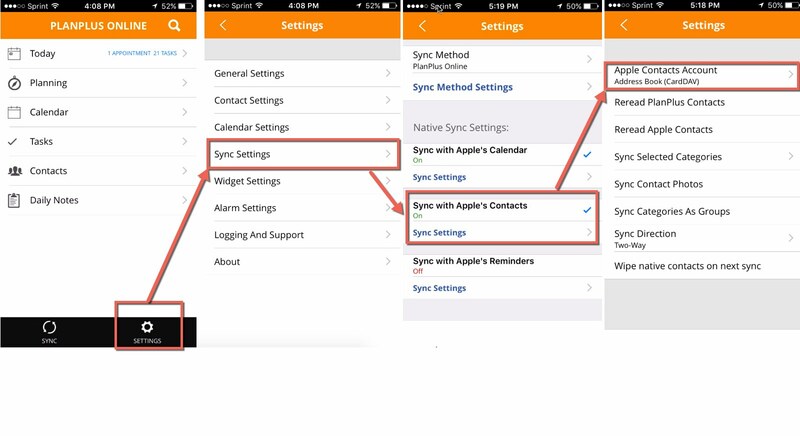 You will need to choose one of your existing accounts if you want to Sync your PlanPlusOnline calendar. If you don’t see the account you need, you may need to add it here using the “Add Account” option. For the account that you wish to sync with PlanPlusOnline, check to make sure that the Calendar & Contacts are turned “ON”. Why does this matter? If the account and record type (Contacts or Calendar) is not enabled on your device, PlanPlus will not be able to sync records with it. This is a typical error found when troubleshooting sync issues. 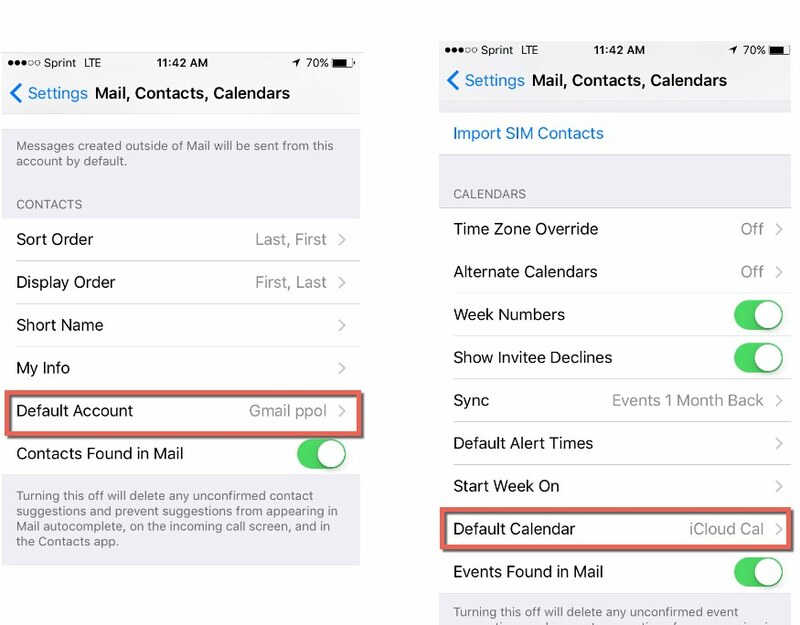 Back at Account Settings for Mail,Contacts, & Calendar. Check your “default” account for Contacts & Calendar.Your default account is the account that new contacts or new appointments would be created on if you add them outside of the PlanPlus app on your phone.Example, if you want to use SIRI to create appointments that show up on your PlanPlus Online calendar, you must select the same calendar in your Default Calendar as you choose to Sync with PlanPlusOnline. Connect your PlanPlusOnline account in the mobile app Sync Settings. Choose a Default Calendar. This is the calendar that all PlanPlus Online related appointments will be written to during sync. 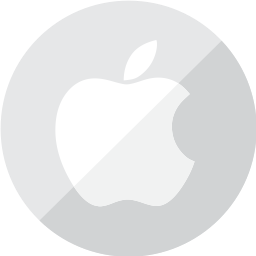 Choose any additional Apple Calendars to display in mobile app: These are other calendars that can be displayed in the PlanPlus Mobile app. These calendars will be displayed in the mobile app but appointments on these other calendars will not necessarily show up in your PlanPlus Online cloud account. Choose your “Apple Contacts Account”. Only 1 contact account can sync to PlanPlus Online. If you need to combine accounts, contact support. Note: generally we don’t recommend syncing with your iCloud contacts because it “can” cause duplicates if you have multiple systems syncing together. Choose a default Reminders list. Choose which lists to sync. Check credentials. Login successful? If problem persists, please submit a case to our support team. Did you press the Sync button? For the time being, you must initiate the sync by pressing the Sync button. 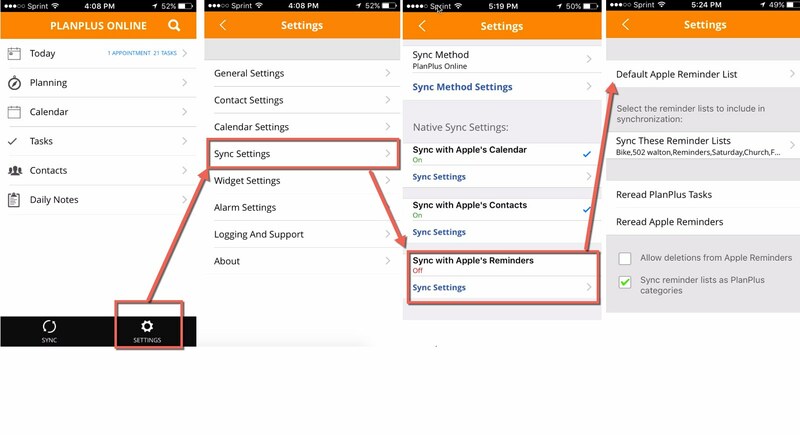 Try syncing one record type at a time (Contacts OR Tasks Or Calendar). This might help narrow down which record type is actually having the problem. If problem persists, please submit a case to our support team and indicate which records are not syncing by providing 2-3 examples. You may have setup a circular sync. If you have configured more than 1 sync connection begin by removing one of them. Leave one sync connection. Give it 1-4 hours to ensure that you are not still having duplicates. you can contact our support team to run a de-duplicate process on your duplicated records. Only 1 instance of recurring tasks will sync. We recommend setting up task recurrences on the browser. If you have a different issue, please submit a case to our support team and indicate which records are not syncing by providing 2-3 examples. A: Auto Sync ever 30-60 minutes, or manually triggered sync. Added Auto-Sync. Sync runs on app open, or every 15 minutes while in use. Improved syncing of deleted records. Task Forward function now moves task to correct date. Various bug fixes. Addressed issue with large data sets. Fixed issue with duplicating appointments. Fixed issue with apostrophes and accents causing duplicates or skipped records. Fixed issue causing Outlook/Exchange Old appt invites to resend. Completed iOS Reminders are syncing as in Progress.